At Etternal, we create the most exquisite works of cremation art with the most talented artists. Sculptors, artists, designers and architects with different tastes and backgrounds have created unique works and series of cremation urns, keepsakes, monuments and jewels produced with the warmest of feelings and respecting the noblest forms of commemorative art. 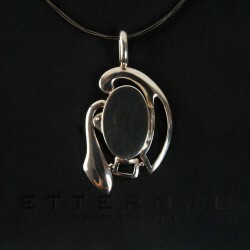 Designer jewellery is not only beautiful and luxurious: it is also the work of an artist and thus contains within it both wisdom and mystery. 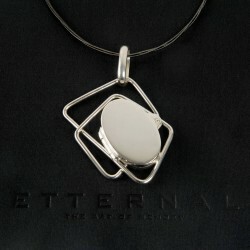 Designer jewellery is not the result of fashion, but flows from a formal requirement stemming from the artist himself. According to Zen Garden's philosophy, the greatness of the Universe lies in simple things. In Japan there is the belief that the passage between life and death, between the underworld and the other world, it is the crossing of a river. The boulders that surface above the water help us walk over the river and show us that path to the afterlife. In line with the naturalist tradition of the Land of the Rising Sun, Japanese artist Yukiko Murata has taken inspiration from the mountains lit on certain nights by the full moon. Human being needs to hold their body onto the earth, on the ground, but their spirit remains always in the cosmos. Elegance and design are the watchwords of this keepsake, the creation of artist Hombrelópez. On the base of a pyramid, the most sublime symbol of Ancient Egyptian memorial art, the artist Cocomir place three bronze swallows providing a marvellous allegory of companionship. 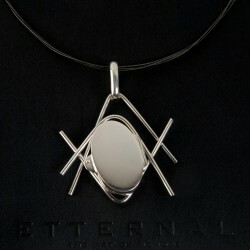 Cremation Keepsake MIRROR PYRAMID K.
According to tradition, the base of the pyramid represents the Earth and its vertex heaven. This keepsake, made of unalterable steel and decorated with Swarovski® Elements, is one of the most exclusive in our collection. On top of the sober aesthetics of the cube, we have created an unique cremation urn with Swarovski ® Elements.